Final assembly of the firewall went well, but took longer than I thought. I decided to squeeze all the edge rivets that I could using the longeron yoke. It worked, but took a long time because I had to slide the squeezer along and remove clecos as I went along riveting. It was tricky getting the yoke over the edges, but I did it. Looking back I should have transitioned to the Backriveting earlier. 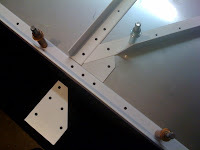 Once I started on the interior angles, the backriveting went really well and was fast. No reason not to backrivet the edge angles as well. Anyway, after about 2.5 hours of work I was beat, so everything is now riveted aside from about 2 rivets in each metal engine mount gussets. Tonight I will finish those quickly and move on to the center bulkhead again. Also, there are two rivets in the top of each floor attach angle that I might have to get Rebekah to shoot while I buck, because I just can't think of a better way to get to those. Sorry for quality of the photos, Bekah is gone this week with the camera so I used my I-phone to snap these shots. These first pics are of the floor attach angles going together for the final time. This was before the riveting and currently only the top two holes in the inside angle remain open. Here are a couple pics of the 99.99 percent finished firewall itself. Today was a long day deburring and countersinking firewall parts. I really tore through this stuff and actuallly got the metal ready for and even completed priming! I also dimpled the firewall and did what I could to debur the holes. They were all pretty clean so not a lot of deburing was necessary. Again Emery cloth worked out well.. Even after the dimples, I was able to run some cloth along the back to further smooth out any sharpies. I don't want to ruin my debur bit, so didn't use it all all on the stainless. I did find that Stainless dimples pretty well, almost no difference than aluminum for this procedure..
All in all, I am now ready for the final rivet step on the firewall. After that I move back to finish the Center bulkhead. Then in a week or so is Arlington where I will get to see tons of RVs and talk to lots of other builders. I continued on the firewall by fabricating more parts, match drilling, and getting out the unibit to cut holes for the brake lines. This is my first experience with stainless, and boy is it different than aluminun. First of all, the edges are extreamly sharp.. I cut myself about 4-5 times already, just minor cuts, but enough to make me to worry about the future.. So I tried to debur with the dremal using a stone bit; the stainless pretty much just chewed up the stone. After going through the entire bit, the edge was better, but still could slice a finger fairly easily.. Then I tried emery cloth that came from my original avery tool shipment. This stuff worked amazingly well. Stainless steel is either super sharp or just dull enough to where it won't cut you, but its a very fine line. A few swipes of the emery cloth changed everything. I have since gone through and deburred the entire thing, I was so confident, Rebekah came out and ran her finglers along all the edges. ;-) For the most part, I have taken the sting out of the firewall. Here is where I drilled the floor support angle, using clamps and a drill bit for spacing. I used some tape to keep the supporting pieces in place until a few cleco's could fit in. Also working with the unibit was different on stainless, I found that the slower the rpm of the bit the better. I used tons of Boe-Lube based on Vans recommendations, but think it still dulled my Unibit. All in all though, I was able to drill the two 7/16 inch holes and they came out pretty well. Each phase of this project is a learning experience and working with this stainless is no different. Since I had the garage mostly organized, I started looking for parts to the firewall. Found most of them and started clecoing them together. The fuselage is going to be quite different to build than the wings I can tell already. The parts went together well, but some of the bent angles coming from Van's will probably need a bit of work as it seems angle doesn't bend that easily. I am not looking forward to bending the longerons since they are about 20 feet of angle I need to manually bend.. But anyway, I got the firewall clecoed together and also worked on fabricating a few additional parts. Almost to the point where I match drill everything, then start the priming process.. The firewall is stainless steel, which is nice, but also sharp. I already cut myself on this piece of metal once. Its tough on tools and tough on fingers. I will try to get a dremel with a stone tip to debur as much of it as I can. I am not sure how much I will prime on the fuse. I know that areas where I have to paint the interior I might wait on until right before I paint it. Otherwise I will have to prime again. For the firewall, I am pretty sure I will just prime it up (aside from the stainless). Now that I have all this metal and small parts associated with the Fuselage kit, I am trying to get organized so I can be productive. I hope to make some shelves out of the wood box that the kit came in. Also, I have bought some organizers and am able to put the bags in them labeled appropriately so there will be no confusion down the road. Hopefully by end of week I will be ready to go. I will post pics as I get the opportunity. Lots of fun stuff in this box to play with, unwrapping each butcher paper package is almost like Christmas Morning. !! The first package of butcher paper I unwrapped unveiled the tail wheel.. I have never owned a tail wheel before.. This is just awesome ! ! The inventory went really fast this time. My mom was in town so was able to help as I tore into the box. We discovered via the inventory that Van's actually sent me a wrong part.. I go two F-719-R's.. I was supposed to get One F-719-R and One F-719-L.. Will call them tomorrow to get it straightened out. The one thing I noticed about the fuselage is the number of smaller parts. You would think there would be lots of bigger parts, but all in all, there are tons of little pieces and bags with fasteners that eventually will go together to make an airplane.. I have no idea where I am going to put all this stuff. 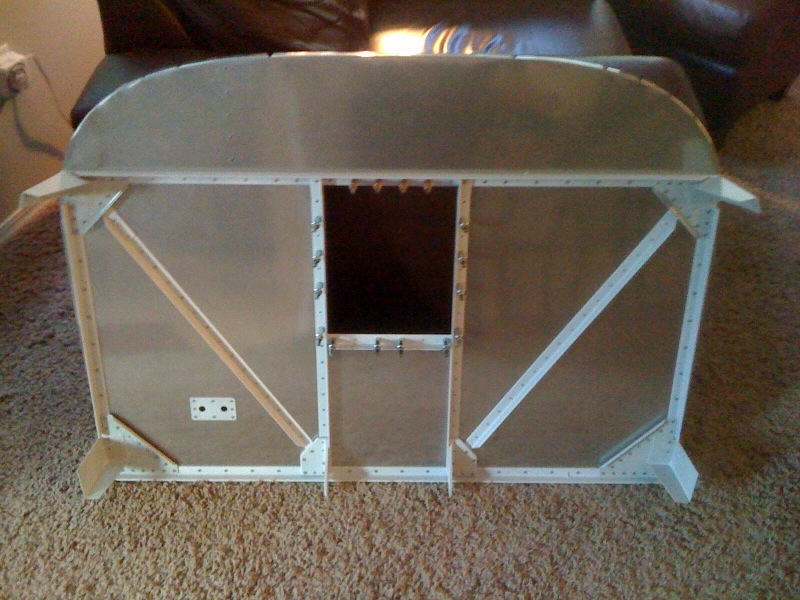 The Fuselage came today via Fed Ex Freight. Van's said it was going to ship on Monday the 21st.. They must have been speedy at packiing this thing because it shipped on Thursday the 17th.. Plus, since it was coming from Portland to Seattle, it ended up being an overnight shipment. Happy day for me, its already in my garage..
Also, funny enough it was delivered by the same delivery guy as my wings. He delivers all the Van's shipments in the area so he knows all the buiders around here, kind of cool. It was fun to show him what came of the boxes he delivered about 9 months ago. Two perfectly constructed Wings.. The fuselage box wasn't as big as I thought it would be, but I had a frendly neighbor over as well, just in case it was too big.. It realy is amazing how much stuff Vans can pack into thse boxes. Fuse will be shipped June 21st, arriving on Wed/Thursday of next week ! Not long now and I will be neck deep in a bunch of Metal..
Good thing the weather is finally nice around here.. 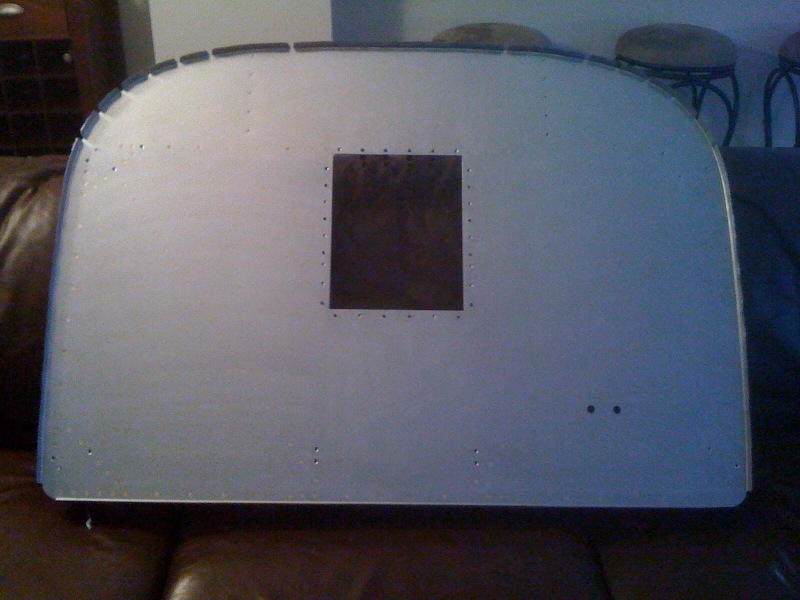 While I am waiting for the fuselage, I am actually starting on the F704 Bulkhead. Traditionally this work is complete after the firewall, but since the parts came with the wing kit I am getting started, but not going to far so as I do something I might regret.. 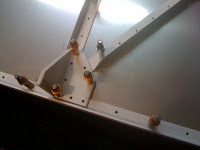 I started by opening up the holes for the Rudder Cables and electrical pass throughs to 5/8 inch. Then I match drilled the Side Brace/Gussets and the vertical shear bars while using the AN bolts to make sure everything was on perfect center. The vertical bars are thick and you have to drill all the way through them. Its important to keep the drill clean and straight for this step. Also, I worked on the 18 nutplates by counersinking the rivet heads and mounting the plates. Note that the directions become much less clear.. Others have had issues in this area as well. For me the big question was weather or not I countersunk where the #8 screw went on these nutplates. It doesn't clearly say in the instructions and I have seen people actually countersink these on some other web sites. 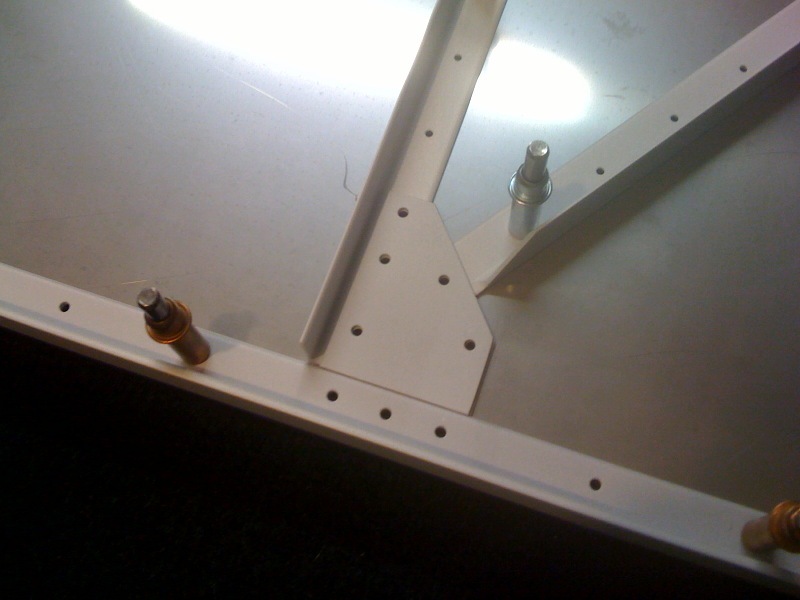 The answer is No, only the countersink for the rivets, not the screws on F-704. The forward seat floor covers this bulkhead and the screws are flat pan head screws that get used, so no further metal removal is necessary. I also found out that it is recommended to dimple and then use the debur tool to remove a bit excess material when working with the side and bottom rivets to this bulkhead assembly, where it rivets to the skins. Its a bit thick to dimple, but you want to get the strength associated vs. removing metal and reducing strength in this location. OK, so you can't ever really say all done until its flying and painted, but I am as close as you can get for now. Ailerons, Bellcranks, Flaps, Tip Lens, Tip landing lights, Wing wiring, Autopilot Servo, Pitot Mast and Tube, all done. Exciting day for sure, now the garage gets torn apart, reorganized and prepared for the fuse which should be here middle of the month..